Striking journalists at a series of weekly newspapers have returned to the newsroom on a ‘work to rule’. 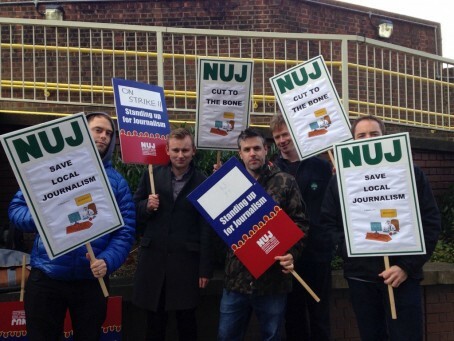 Members of the National Union of Journalists went back to work yesterday at Newsquest South London titles after a fortnight of action in total. The ‘work to rule’ means journalists will strictly adhere to company or statutory work-related rules already in place. The ongoing dispute follows plans which would have seen a single pool of 12 reporters working across all South London titles, with all bar two of the 29-strong newsroom placed at risk of redundancy. The union previously claimed seven reporters had resigned in protest at the plans, which would mean up to 11 job losses across the South London titles. Papers affected include the Guardian series in Croydon, Epsom, Kingston, Richmond, Sutton, Wandsworth and Wimbledon, the News Shopper series covering Bexley, Bromley, Dartford, Gravesend, and Greenwich, the Richmond & Twickenham Times and Surrey Comet. A Newsquest South London NUJ chapel spokesperson said: “We demonstrated to the company our rejection of their proposed structure. “Spirits were high over both weeks and we had phenomenal support from other journalists, as well as our readers and elected politicians. We went out to our patches to let readers know what exactly Newsquest is going to do to their beloved local papers. In my (long) experience, work to rules rarely have the desired effect so I wish them well. I recall a winter in the 1970s when we withdrew our cars from company use which saw us sitting on freezing buses to and from parish councils in the depths of nowhere, in the dark. I told one council that they’d have to wind it up before 9pm as my mother was calling to collect me! They were very obliging. Possibly the best time was when my editor phoned me at home to ask if I would mind doing a concert review that night because he couldn’t get anyone else, and when my father said I was out, the editor asked if my father would do it instead! He refused. In my (too long) experience, work to rules worked just fine. It meant, in those days, anyhow, you weren’t allowed to pick up a phone after 5pm, could not go to a job unescorted by a senior if you were a trainee (which most of us were) and you strictly did your hours and no more. Best thing was, because we were actually at work, the firm were obliged to pay us, which did not happen during a strike.